Advantages: Extensive photographs with English text and subtitles and 9 profiles. This newest volume in the Finnish Air Force History series provides a very good overview of two great British aircraft in the service of the FAF. Finland bought 12 Hurricanes, with only 10 making it into service. As for the Gladiator, the Finns received 30 Gladiators, ten of which were gifts, the rest were purchased. The book covers both aircraft in the same well organized manner. Each section begins with a description of the development of the aircraft, its manner of procurement, a description of the camouflage and its specifications in FAF service. The volume then goes on to give a brief chronological narrative of each aircraft in FAF service. In the section on the Gladiator, the authors include a description of the service of Flygflottilj 19 (F 19) in Northern Finland during the Winter War. This was a unit of Swedish volunteers who flew their J8 Gladiators and Harts in support of the Finns. As with all the other volumes in this series, this one is full of excellent photographs. There are a few that deserve particular attention. First there are two very good photos of a VVS Hurricane IIb, BM 959 White (Silver?) 60. This is the well known aircraft with the wolf on the fin and rudder. But even with that picture, I am unable to determine whether the wolf and number are white or silver or whether the letters over the red star are yellow, white or silver. The other pictures of note are of the Swedish J8 Gladiators of F 19 just prior to their departure from Finland, when they had their Finnish markings painted over. These are some of the clearest, most sharply focused pictures of these aircraft I have ever seen. Finally, there are a series of 1/72 scale line drawings of the Hurricane and Gladiator. For the aircraft modeler, this volume may provide a few surprises, particularly with regard to the Hawker Hurricane. The first surprise is that it appears that not many of the Mk. I Hurricanes purchased by the Finnish Air Force had fabric wings. Of the ten Hurricanes that made it into service, out of the twelve purchased, only three had fabric wings: HU (later HC/HC-) 451,455 and 456. HU462 had fabric wings, but never made it to Finland. The other surprise was that the Hurricanes in the Dark Green and Dark Earth RAF scheme did not have all aluminum undersides. Rather, the Hurricanes arrived in Finland in the factory applied RAF scheme that included black and white wings in a certain pattern. Sorry, I’m not going to give away the details of the plot. The all aluminum undersides apparently were applied after the Hurricanes received their FAF warpaint of Olive Green and Black. Hurricanes repainted after May 1942 received the DN Light Blue underside. I must admit, the Hurricanes in the RAF scheme with yellow under-wing tips and fuselage band (but not a yellow nose) are quite colorful, and different. For fans of either the Gladiator or Hurricane or the FAF (or all of them) this newest volume will make an excellent addition to your library. 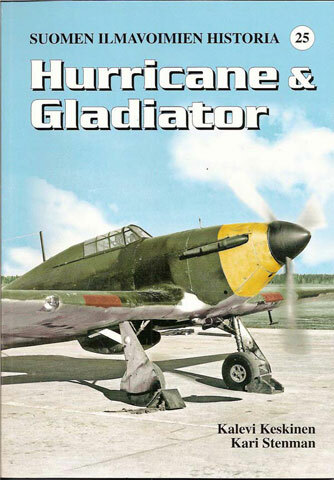 For the Hurricane modelers, in 1/48, no matter whether you go with the Classic Airframes fabric wing or Hasegawa metal wing Mk. I, or both, this book will be an excellent resource in painting your model. If you have a Roden Gladiator and are into a bit of scratch building, this volume will provide some great inspiration and detail if you decide to open the gun bays.